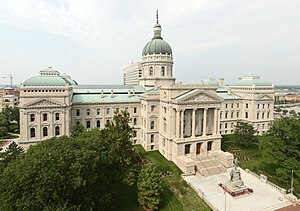 Just hours after it was passed by the state legislature on Wednesday, Indiana’s right-to-work bill became law with governor Mitch Daniels’ signature. With that move, Indiana takes its place as the nation’s 23rd right-to-work state—and becomes the first to take that momentous step since Oklahoma in 2001. Of course, both unions and those who seek to check their power also come amply armed with data contrasting the economic and employment climate in right-to-work and forced-union-dues states, with each side claiming their particular stats tell the true tale. That’s truly the essence of right-to-work laws—both in principal and in prose. If you’re skeptical, you need only skim the text of any existing right-to-work law. In an age of 2,400-page federal health reform bills and 2,300-page financial reform laws, they’re almost astonishingly brief . Go ahead—click a right-to-work state on this handy map and you’ll see in black-and-white the surprisingly simple nucleus of the right-to-work debate. Right-to-work laws reinforce and protect a vital American freedom: the freedom of association. In most discussions of right-to-work, the emphasis is on the freedom not to associate, since these laws prohibit employers from making union membership or the payment of union dues a condition of employment. However, right-to-work laws are equally protective of workers’ freedom to voluntarily associate with unions, barring employers from firing workers who join them. Unions argue that right-to-work laws enable employees to become “free-riders,” enjoying the presumed benefits of union efforts without having to pay for them. However, their logic withers when you examine the underlying principles at play. Labor unions insert themselves into voluntary associations between employers and workers to offer their own product: representation. In a free country, one shouldn’t be compelled to purchase a product because its vendor assumes it has value. Unions have no more right to use force to obtain compensation for their services than I do for mine. The political geography of right-to-work is intriguing. As that same map shows, the 22 states that had already enacted right-to-work laws are contiguous. When Indiana’s law takes effect on March 14, it will become an island of labor liberty in a sea of forced-dues coercion; perhaps it will someday be remembered as an initial beachhead in America’s union-heavy Rust Belt. Either way, you can’t gaze upon that map without wondering which state will be next—and yes, Big Labor, the nation will surely advance to 24 and even 30 before it ever retreats to 22. Considering that New Hampshire proudly calls itself the Live Free or Die state, it’s a shame its governor recently made a mockery of that motto by denying his citizens freedom from forced dues. If some federal legislators have their way, governors’ stances on the matter may be rendered moot: The proposed National Right to Work Act would do for the entire country what Indiana and the other 22 states have had to do individually—and painstakingly. As one who favors greater state autonomy, I’ll admit the notion of a federal move on the matter gave me pause–until I learned that the National Right to Work Act wouldn’t add a single word to federal law. Instead, it merely deletes five sinister provisions of the National Labor Relations Act and another in the Railway Labor Act that authorize employers to fire workers who refuse to pay union dues. Passage of the National Right to Work Act would represent but one key step in the nation’s long path back to the principles of liberty upon which it was founded. Taking that step merely requires the acknowledgement of a simple and undeniable truth: Any system where collusion between employers and unions forces individuals to surrender wages to an organization they’ve decided not to join is indefensible. *A writer’s postscript: A few months after posting this, I realized the imperfection of right-to-work laws from a libertarian perspective and thus the imperfection of my argument. Specifically, right-to-work laws represent government force: The state is forbidding an employer from hiring only union workers. Employers should, of course, be free to make such a decision if it’s made without coercion. That said, I still favor right-to-work laws because they balance a far greater exertion of government force in the form of labor laws that prevent employers from exercising their right of free speech by actively dissuading workers from joining unions. I recognize, however, that this is a “better of two evils” conclusion on my part.